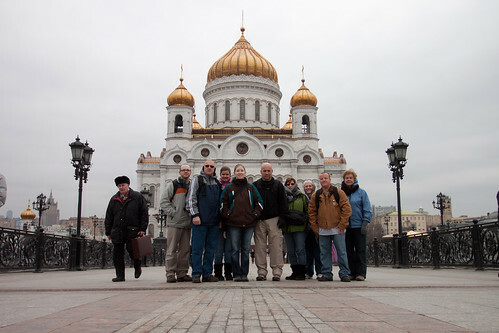 I just returned from my fourth mission trip to Moscow, Russia. This was an incredible trip for me. I will hopefully write later on the actual events we attended. If I did that now, this entry would be way longer and I doubt anyone would read through it. I was able to see my friends Jeremy and Deana come full swing from leaders in our NC church to mission trip leading to being the missionaries. It has been cool for me to see Jeremy realize the call God had placed on his heart on our last mission trip and then to see him and his family living that mission. Talk about total obedience. They had to leave the comforts of their home, their family and friends, and their country. They didn’t do this because it was easy by any means. They did this because they serve an awesome God that has plans for them and their love for the Russian people. I thank God that He put these people, these friends…no, these family members in my life. What an example! I believe that God is always at work. I consider it extra special when He allows me to see just how He is working in my life and through me. Ten weeks ago I began a fitness competition at work. This involved getting regular sleep, drinking 64 oz. of water a day, working out 30 minutes a day (7 days a week), eating veggies and fruit, toning, etc. This year I decided I was going to work harder than I had in the past. I woke up an hour earlier in the mornings and worked out. I was doing all the things required of me for this competition. I will revisit this topic in a few minutes. I visited my doctor for a yearly checkup and during this visit she recommended that I go to another specialist for a simple treatment. I was nervous to find a specialist that would be sincere and legitimate. I prayed and with Justin’s help we found one. I made an appointment. When I arrived I immediately felt comfortable. The lady was explaining the procedure and told me I would have to come back in a couple weeks for a follow up visit. I told her I was going out of the country soon and wondered if that would interfere with the process. She paused, looked at me and said, “Are you going on a mission trip?” I told her I was and then our conversation immediately turned to God and my trip. I told her I was going to serve with our missionary friends in Russia. I also explained that we would be visiting a small church in Rzhev and told her about Misha and his family serving as a pastor there and how they live off very little a month but are so devoted to God’s call for the Russian people. She continued to tell me about how she didn’t really grow up in a church but had a catholic background. She said she attended a church once and was pretty involved in it. Then she got a divorce and the church turned away from her. She was devastated and stopped going to church. Not too long ago a friend had invited her to church, my church (GCC). She loves it. At that moment I knew that God had heard my prayer of concern for finding the right specialist. I knew He was sending me a message that He was taking care of me. As she continued to tell me about herself, I found out that she lives on a meager income with some assistance. She didn’t have a lot of money to spare but was so thankful for what God was doing in her life. She told me her daughter and grandkids have even started to attend the church. She felt renewed. We talked on and on about GCC and God and at the close of our meeting I began to sift through my purse to get my money to pay her for the visit. She stopped, looked at me and said, “This is just between me and you now, but as we were talking I felt God telling me this. Would you be willing to take the money you would pay today for my services and give it to that Pastor in Rzhev?” I couldn’t believe it! I agreed right away. She told me she had been praying to God to give her a way that she could take what she had and help someone. She felt that this was what she had been praying for. I was amazed! Speechless! I had just met this lady. As God had planned it, Joy (the leader of the mission trip) had sent an email of a picture of Misha and his family and so I had it on my phone to show her who the money was going to go to. God knew what He was doing. He answered both of our prayers by bringing us together. We both sat for a moment with tears in our eyes. What an encounter with a servant of the Lord and my Lord Himself. I went back a few weeks later before my trip, fully expecting to pay again and she said, “No honey, take this week’s money too.” I promised her I would hand deliver the money. I was able to tell Misha and his family the story of my encounter with this lady (of course with tears streaming down my face). To realize while in Rzhev that God was also working in Misha’s family’s life through this encounter just blew me away. I don’t know what will be done with this money but I know it has a divine purpose and came thousands of miles to further God’s kingdom. Our team was made up of members from several churches. We hadn’t had the time to connect fully as a team as we had in the past. Justin and I being hundreds of miles away didn’t help matters. The day of the trip came and we anxiously awaited our reunion with the team and also meeting new faces. It was awesome and before long it felt like old times. We made it to the London airport (one of the largest airports in the world) to find that our flight to Moscow had been cancelled. We were assured that we, as well as our luggage would make it on the next flight (in 4 hours). We asked for directions to the airline counter to get booked for the next flight. Four hours was plenty of time, right? Wrong! Each airport employee we would ask for directions sent us to a different spot. We were on one big wild goose chase. We went through security multiple times as we went in circles. We finally found the counter and stood in line for what seemed like hours. By the time we got tickets we were rushed to get through security…again. We also had to get our luggage switched to the new flight. While Justin and I were at the Chicago O’Hare airport starting our trip, the folks there didn’t give us our part of the luggage tickets. By the time we realized it, it was too late to go back. We thought we wouldn’t need it. Fast forward to the London airport. They needed our luggage information to get our luggage. We didn’t have it. Getting on the flight knowing that we wouldn’t have our 3 bags at the other end was hard. At this point we had been up for 24+ hours. We didn’t have a change of clothes in our carry-ons either. Joy’s bag was searched as we only had minutes to board our flight to Moscow. We split our team in thirds and all ended up running to board the bus that would bring us to our plane (so much for having plenty of time to make our flight). We made it though. We finally landed in Moscow to more troubling news. None of our luggage made the flight. Luckily a nice airport employee went with Joy to find Jeremy who had been waiting for us. Jeremy could now translate for us. We filled out the necessary paperwork and finally left the airport. We had made it to Moscow but we all had to improvise with what we had. I spent over 48 hours in the same clothes. They were comfy clothes for the plane ride, not the best for cold Russian weather. Nine of our fourteen bags arrived the next evening. Five were still missing (3 being mine and Justin’s). Returning now to my fitness competition. It had been seven weeks since the competition started when I left for the trip. Our friend Heather was on the trip with us. She is smaller than me. She was one of the lucky ones to get her luggage first. She had a pair of jeans I could borrow. I was not confident they would fit but tried them anyway. To my surprise, they fit! I could now get out of my original clothes. God is so good. Not only did He give me an amazing friend that would give me a pair of her jeans (pjs too), but He was already at work seven weeks ahead of time knowing what was to come. I had lost just enough to be able to fit in those pants. That was no accident! Looking back we know that God was at work. Faye (one of our team members) thanked God in one of our prayers for keeping us off our original flight. She said she just knew something was wrong with that plane and there was a reason we didn’t get on that plane. At the end of our trip we had a debriefing time and prayer. As I prayed I realized that we also didn’t get on our original flight so that we would be strengthened as a team. We all had to work together to make things work and shared everything we had with each other. I believe that starting our trip like that made the entire trip more successful. God loves when we pray and have an open communication with Him. I find that the more I involve Him in my life, the more I see Him at work. I’m always watching. God also taught me on this trip to pray specifically. This is actually quite comical but I had to share. On the flights to Russia we were on planes with 3-seaters, meaning Justin and I had to sit with a stranger on those long flights. The last time we went to Russia we were fortunate to have 2-seaters. I prayed that on the longest flight back to America we would have 2-seaters. I also prayed that we would have screens on the back or our seats to make the time go faster (movies, games, etc.). I prayed that we would be able to sit closer to our friends so we could talk to them. God answered every one of my prayers. We boarded the flight and we had 2-seaters, monitors, and we weren’t far at all from our friends. The funny part is that my monitor was broken. It was there but I had no power and my overhead light was on (and I couldn’t turn it off). I guess I needed to be sure to pray for working monitors (haha). I think sometimes we pray for things on such a broad spectrum that we forget the rest. I had prayed for safe travels for us but forgot to pray for no cancelled flights. God knows exactly what we need but I think He would like to hear it from us. God was with us throughout our trip. We were able to attend English clubs, two church services, two children’s homes, the Rzhev church, an elementary school, the University of Business and Finance, and Deana’s women’s group. We met so many people along the way (Justin calculated over 200 people). We were able to hopefully lift up Jeremy and Deana and their kids and give them encouragement to continue their work. It was neat for me to see how far Russia has come from my first trip to this last one. God isat work. There are a lot of people there and it won’t happen over night but He is there.